Adventures in Automation: Boston area recruiters: What is your day-to-day life like? How do you see the Boston area software testing industry? Boston area recruiters: What is your day-to-day life like? How do you see the Boston area software testing industry? I'm going to be writing a series of article about the day-to-day life of a recruiter. I was wondering if I could get your input? 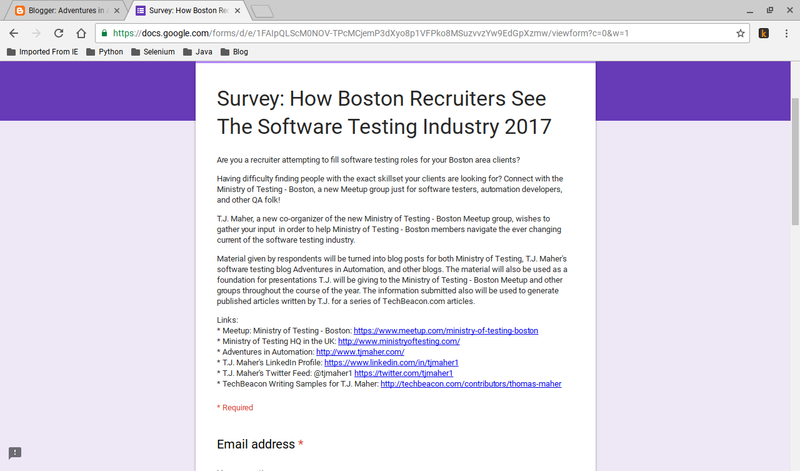 The other focus will be how Boston area recruiters see the Boston area software testing industry. 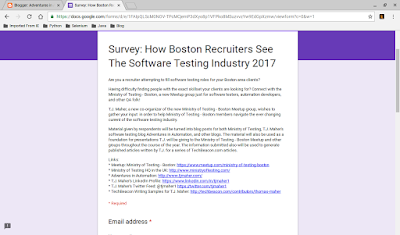 I was thinking of gathering information and sharing it with the new Ministry of Testing - Boston meetup with a series of blogs, articles, and presentations. Please like and share this with your co-workers! Thank you very much!